Pinbar Detector is a MetaTrader indicator that tries to detect Pinbars (also known as "Pin-bar" or "Pin bar") and marks them by placing a "smiling face" symbol below the bullish Pinbars and above the bearish Pinbars. 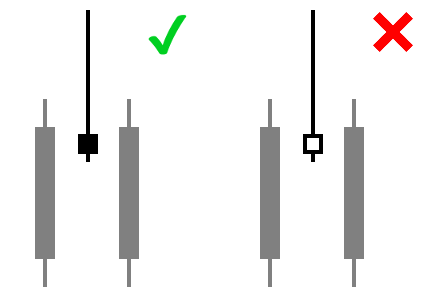 It is a pure price action indicator, which is not using any standard technical indicators in its code. The configuration of Pinbar detection can be done via the indicator's input parameters. Pinbar Detector can issue platform alerts and email alerts on detection. The indicator is available both for MT4 and MT5 versions of the trading platform. CountBars (default = 0) — the maximum number of bars, on which to detect the pinbars. 0 = all. DisplayDistance (default = 5) — the distance from the candles to the pinbar "smiling face" symbols. UseAlerts (default = true) — tells the indicator to issue platform alert with sound on Pinbar detection. UseEmailAlerts (default = false) — tells the indicator to issue an email alert on Pinbar detection. Email should be properly configured in MetaTrader via Tools->Options->Email. UseCustomSettings (default = false) — tells the indicator to use custom Pinbar detection parameters described below. 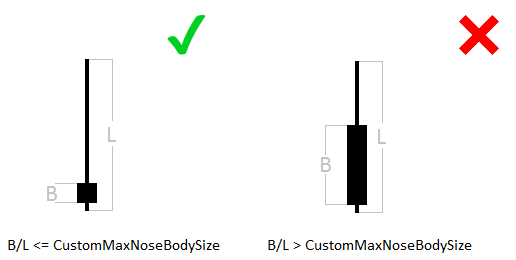 CustomMaxNoseBodySize (default = 0.33) — maximum allowed body/length ratio for the Nose bar. 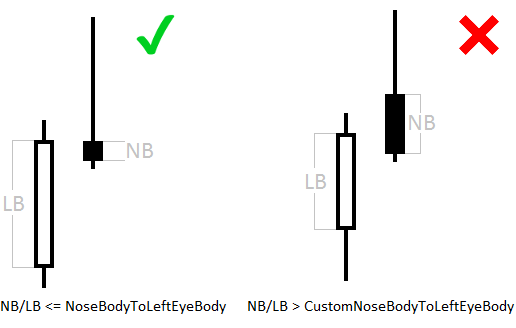 CustomNoseBodyPosition (default = 0.4) — Nose body should be positioned in the top (bottom for bearish pattern) part of the Nose bar. 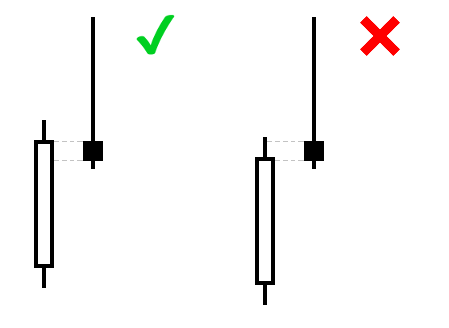 CustomLeftEyeOppositeDirection (default = true) — tells the indicator that the Left Eye bar should be bearish for bullish Pinbar, and bullish for bearish Pinbar. CustomNoseSameDirection (default = true) — tells the indicator that the Nose bar should be of the same direction as the pattern itself. CustomNoseBodyInsideLeftEyeBody (default = false) — tells the indicator that the Nose body should be inside the Left Eye body. 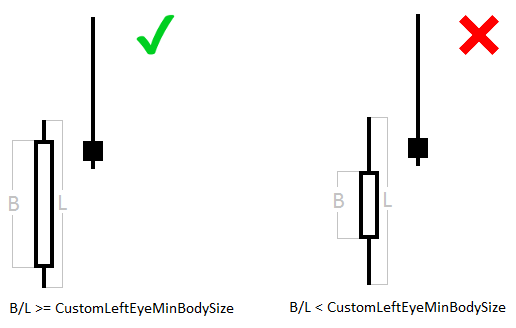 CustomLeftEyeMinBodySize (default = 0.1) — minimum size of the Left Eye body relative to the bar length. 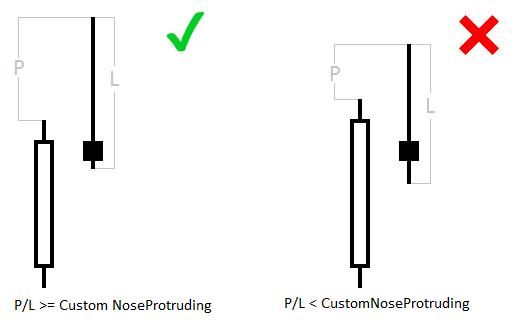 CustomNoseProtruding (default = 0.5) — minimum protrusion of the Nose bar relative to the bar length. CustomNoseBodyToLeftEyeBody (default = 1) — maximum size of the Nose body relative to the Left eye body. 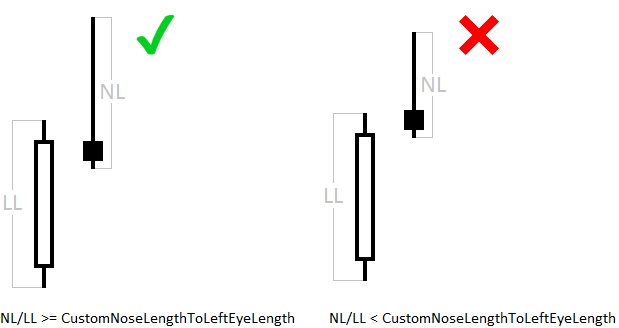 CustomNoseLengthToLeftEyeLength (default = 0) — minimum Nose length relative to the Left Eye length. 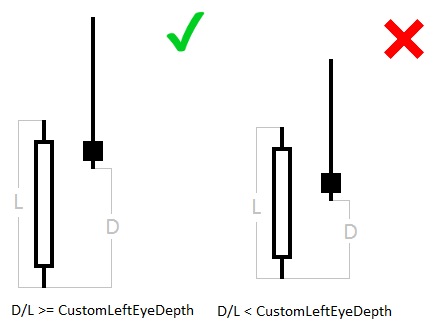 CustomLeftEyeDepth (default = 0.2) — minimum depth of the Left Eye relative to its length. Depth is length of the part of the bar behind the Nose. As you can see on the chart above, the indicator is not perfect as is the Pinbar pattern itself. It is recommended to try different detection settings to filter patterns according to your own image of a perfect Pinbar. 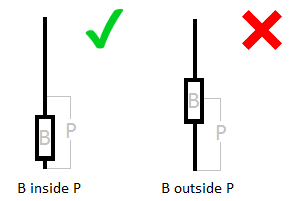 You can use our basic strategy for trading Pinbars, or you can try developing your own, depending on the aggressiveness of your overall Forex trading style. A good idea would be to attach this indicator to long-term timeframes (from H1 to W1) on all currency pairs you are comfortable trading in. Then, alerts would let you know once the trading opportunity arises. 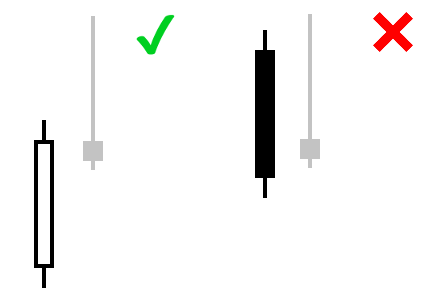 Do you have any suggestions or questions regarding this indicator? You can always discuss Pinbar Detector with the other traders and MQL programmers on the indicators forum. Added input parameter DisplayDistance to control the distance from "smiling faces" to candles. Added input parameter CountBars to limit the number of bars to detect pinbars on. First release of Pinbar Detector.